PHOENIX, Dec 3 - If what the New York Times reported this morning is true - that IBM is in negotiations to sell its beleaguered PC unit to Lenovo, the largest Chinese PC maker, a story about which IBM had no official comment - the move deserves loud cheers and a long applause. Perhaps not as long as it took for IBM to finally "hear us" (over 12 years! ), but long enough to be heard around the globe. The fact that IBM seems to have finally heard us and is acting accordingly, is certainly a breath of fresh air coming out of Armonk. "Getting rid of its losers is the kind of a move that we also said was necessary if IBM is to grow again..." (see Annex Bulletin 2004-10, Apr 7, 2004 - "Ditto, Ditto! Is Anybody Listening?"). It was only the last in a series of articles dating back to August 1992 (see Appendix A below, "Robbing Peter to Pay Paul") in which we expressed similar sentiments. And again in March 1996, when we urged Gerstner to break up IBM and sell its PC unit close to its peak (see Appendix B and the chart). The New York Times seems to have also noticed it. "For nearly a decade, though, some industry analysts have urged I.B.M. to get out of that business as it made only a modest profit or lost money, the Times said. "For this year, analysts have expected a pretax profit of less than $100 million." Last year, the IBM PC unit lost $118 million pretax on revenues of $11.4 billion. This year, we figure that will grow to over $13 billion (see the chart). Paying $1 billion to $2 billion for a $10 billion-business doesn't seem like much. Except when you consider that the PCs have not done much for Big Blue's bottom line during the 23 years of their existence. Then it could seem too much. That's because IBM PC losses piled up, especially in the early 1990s, when we first urged that IBM get out of this business. So paying something, anything... to take this headache off IBM's shoulders is doing Big Blue a favor. The stock market seemed to agree. The IBM stock moved up about 1.5% to $97.22 on the news of a possible sale, and on Intel's bullish outlook for PC demand. As for the Lenovo shares, traded on the Hong Kong exchange, they barely moved on the news. As you can see from the above chart, the Chinese company's stock has generally moved with the ups and downs of the PC market (read Intel, the bellwether PC stock). Lately, it's been both up and down, but generally up, along with the entire global PC market. Lenovo, partly owned by the Chinese government, had sales of over $3 billion last year. It is ranked eighth globally among the PC makers. It is the overall leader in Asia, except in Japan, where NEC, Fujitsu and other Japanese companies dominate. The fact that IBM PC sales are also brisk in Japan (IBM is ranked fifth there) makes the possible deal even more complementary to Lenovo's Asian market ambitions. Lenovo was formed in 1984 by a group of Chinese scientists with government financing. The company then known as Legend started out as a distributor of computers and printers, selling IBM, AST and Compaq PCs in China. As the market began to get commoditized in the late 1980s, Lenovo started to build its own PCs. By 1997, it had surpassed IBM to become the largest seller of PCs in China. The timing of the IBM PC sale is auspicious. After peaking in 1999 at over $15 billion in revenues, the PC unit's business had contracted at about 6% per year. Now that it is a growing concern again (we expected it to increase by 16% this year), and it is even making some money, why not put it on the block? Goodbye Charlie! 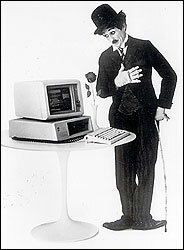 (Charlie Chaplin had been IBM PC's first mascot). And good riddance to red ink at Big Blue. PHOENIX, Dec 8 - It's been a long time coming, but it's a "done deal" now. After 13 months of secret negotiations that the New York Times reporters cracked last week, Lenovo and IBM announced today (Beijing time) that the largest Chinese PC maker is buying the IBM PC unit for $1.25 billion plus $500 million in Big Blue liabilities. Lenovo will pay IBM $650 million in cash and up to $600 million in stock, or about 19% of its equity. IBM will record a one-time gain of $900 million to $1.2 billion when the transaction closes in the second quarter of next year. Bib Blue will retain a 19% share of the new world's No. 3 PC vendor, and Lenovo will retain the right to use the IBM brand name for five years. The new company will be headquartered out of New York. Steve Ward, currently IBM senior vice president and general manager of IBM's Personal Systems Group, will serve as the CEO of Lenovo following completion of the transaction. Yuanqing Yang, currently vice chairman, president and chief executive of Lenovo, will serve as chairman of Lenovo. That's the nub of the deal. Sweet. An obscure Chinese company becomes a global IT player practically overnight. IBM gets rid of the dud (by its standards), and records a gain. It's a win-win for both sides. IBM CEO Sam Palmisano said in a statement to employees that the decision to sell was part of IBM's continuing effort to focus on high-margin businesses. "For some time we have said that there are two ways to create long-term value for clients and shareholders in the IT industry: Invest heavily in R&D and be the high-value innovation provider for enterprises, or differentiate by leveraging vast economies of scale, high volumes and price." "These are very different business and economic models, and they will diverge even further in the years ahead." "The PC business is rapidly taking on characteristics of the home and consumer electronics industry, which favors economies of scale, pricing power and a focus on individual users and buyers." Palmisano should know that better than most. He once ran the IBM PC business. Or putting it more succinctly... he survived the PC business on his way to the top. "One solution is to make IBM smaller. Make it smaller to boost its value? Precisely! There are plenty of examples in nature to support this view. An amoeba splits up, for example, it order to perpetuate life. Vegetation at the site of a forest fire is always richer than it was before the fire. But we don�t have to stray too far a field to make the same point in business. Sometimes the sum of the parts can be greater than the whole (company)." At the time, our recommendation made quite a splash in the global media (see the slide from our 1996 workshops). But it fell on deaf ears in Armonk. The former IBM chairman responded in August 1996 saying that breaking up IBM was "a dumb idea" (see �Louis XIX of Armonk,� Aug. 1996). Guess Lenovo's Yang and IBM's Palmisano thought otherwise... to the benefit of their respective shareholders. When this writer first heard the name Lenovo, he thought it was a Russian company. (c) Copyright 1992 by Annex Research. All rights reserved. IBM To Cast Off Its Calves First, Instead Of "Cash Cows"
THE "NEW" IBM: "ROBBING PETER TO PAY PAUL"
Some time this September, IBM is expected to announce a "new" unit which will handle its low-cost personal systems. The reason the word "new" is in quotes, is that the truly new part of the venture will be its reduced Selling, General and Administra�tive (SG&A) expenses. This will make it appear that the IBM PS line can stand on its own. But, appearances can be deceiving. Last year, the IBM PS LOB caused the corporation to lose a lot of money. As if that weren't enough, this IBM unit also lost about seven market share points. This year, things have gone from bad to worse. And even with the new lower SG&A expenses, the new PS unit will barely make ends meet (see the Tables). Yet, casting off a new PC unit is precisely what IBM Canada Ltd. also did on June 4, when it spun off Exper-Comp Services Ltd., a new subsidiary which will sell cheap IBM personal systems and even clones (like the Ambra, an offshore clone). The IBM an�nouncement meeting was unusual in that it was held at a trendy downtown Toronto restaurant. At the time, IBM Canada hailed the move as a new philosophy of "high style and low prices," just like those at the "Maccheroni Trattoria." In the U.S., IBM is expected to dedicate to the new PS LOB a "blue suit" sales force of only 500 people. They will handle about 2,300 "named" corporate accounts. The needs of all other IBM PS customers will be served by indirect distribution chan�nels. As a result, the new unit's sales overhead will certainly be much lower than IBM's corporate SG&A expenses. But, some other IBM LOB will have to pick the tab. So, what's the point of this "robbing Peter to pay Paul"-IBM strategy? "IBM wants to eliminate the 'cash cow's' subsidizing of others," one industry source contended in our conversation this week in New York. "That's what (John) Akers said last year" (see CMS BULLETIN 91-32, 6/18/91). "Then IBM has a funny way of doing it!" we replied. "A sure way of implementing such a strategy would have been separating the 'cash cow' from the calves. Spinning off one of its weakest and thirstiest calves, while the rest of the weaklings keep feeding off the stronger LOBs' anyway, will hardly 'eliminate the 'cash cow'-syndrome, will it?" Our listener nodded pensively. If IBM had its shareholders' best interests at heart, we continued, a better way would have been to spin off the ABS LOB first, then the ES or AdStar LOBs. Later in the week, we also had a chance to discuss these issues with a senior IBM executive. We asked Mr. X if he could explain the rationale for splitting off the PS LOB first. He said that he'd give us the "party line," but did not want us to think that he himself believed it all. What follows is an approximation of that conversation. Personal Systems is the part of the business which drives the technology the fastest. As a result of such torrid pace, this LOB must have the quickest product development, and the shortest delivery to market cycle. It is believed within IBM, Mr. X said, that spinning off a subsidiary would free it from being constrained by the IBM rules. Which, in turn, would short�en the product-to-market cycle, and make the PS LOB more nimble. We agreed. But then, the same argument could be made for almost any part of IBM. So, why go first with the PS LOB? Mr. X said that the second reason for spinning off a PS LOB is that its distribution costs represent such a big part of the total product costs. As the pace of competition in Point 1. (above) increases the pressure on gross margins, it becomes impor�tant to be able to control the distribution costs. In IBM terms, this "control" means that the PS LOB would not carry the full IBM marketing overhead, as the rest of the LOBs are supposed to. "I am not persuaded," this writer said. "This only means that someone else will have to pick up the tab." Mr. X continued by saying that the third reason is the industry trend toward desktop computing. "IBM cannot afford NOT to be a player in this market," he described the arguments ad�vanced by the proponents of an independent LOB. "'Other IBM LOBs benefit from this,' they say. The question is -- is this worth IBM losing a lot of money?" Indeed. Then, answering his own (above) question, Mr. X added the number four reason -- outlasting the competition. Some people think, he said, that the current price wars will result in an industry shakeout. So, if IBM hung in there long enough, other players may leave the market first. After that, things would get better again, the pro-PS LOB advocates reason. "Why throw good money after bad?" this writer thought, but said nothing. The fifth reason is that a large share of profit in the PC business comes from software and services. "That's another reason for tolerating the hardware losses," Mr. X said. "So, the PS LOB's business premise is based on the 'privilege' of giving away the hardware?" we asked partially tongue-in-cheek. He laughed. "Exactly!" he replied. "But, who says you have to have hardware" (to play in the software/services game), we asked a rhetori�cal question. "Why not be just a software and/or value-added service supplier, and leave the commodity business to the compa�nies with lower expenses and smaller margin expectations than IBM's?" The basic flaw with the entire IBM "restructuring," we continued, was that no one seems to be asking the question "what kind of a business do I want to be in?" "Remember: I didn't say I believed all of it either," Mr. X replied. Our conversation on this subject seemed to be grinding to a halt. "Is that it?" we asked. "Those are all the reasons?" Mr. X seemed to be straining to think of another one. "Pretty much," he finally said. "Well," we said. "My turn now. Let me give you a few reasons why splitting off the PS LOB first may be a BAD idea. Let's start with the PR. 'Everybody' knows that this LOB has been a big money loser for IBM. So, why focus the world's atten�tion on a company's WEAKNESS?! People who are not well versed in IBM's business may say; 'Gee: all I ever see or hear in the media is IBM PC, IBM PC.... And if IBM is losing money in the PC business, just think what the rest of the company must look like!?' If such a person were also an IBM shareholder, he may even pick up the phone, call his broker, and say: 'Sell!'" "I just thought of a number six reason," Mr. X interjected. "Attracting other investors." "That should have been the number one reason, in my books," we replied. "But just where, do you suppose, IBM would find a big enough sucker? (to buy the money-losing PS LOB). These are big numbers, you know. There aren't many people with that kind of money. And those have it, usually are not suckers." Mr. X grinned. We said that if one were dressing up the IBM portfolio from the shareholders' standpoint, one would try to talk about success stories first, such as the ES, ABS or the AdStar LOBs. "I feel that the management's primary responsibility must be to the shareholders," this writer said. Of course, making customers happy will often mean making shareholders happy, too. But, not always. Giving products away, for example, may please customers, but would probably anger shareholders if it caused losses. insiders, however, appears to be September 22.
casting the ES or AdStar LOBs from the rest of IBM. (see CMS BULLETIN 86-44, 11/06/86). etc. The mainframe LOB (ES), by contrast, rarely exhibits high public profile. (c) Copyright 1996 by Annex Research. All rights reserved. Six Steps to Riches: How Should IBM Be Split Up? Step 1: Spin off and report separate financial results for the IBM Global Services, including the Integrated Systems Solutions Corp., its outsourcing subsidiary, as well as maintenance. Step 3: Consolidate the remaining high-margin product businesses - S/390, AS/400 and RS/6000 into a single IBM Server company. It should include the respective OS software (OS/390, OS/400 and AIX). Step 4: Evaluate the feasibility and desirability of spinning off the non-OS software into a separate business, such as the network-related (Lotus+), or other IBM software (e.g., middleware; VisualAge, systems management tools/Tivoli, etc.). Step 6: Increase the IBM dividend as the financial benefits rise (i.e., the shareholders� value). What would it take for Gerstner to make our six-step blueprint a reality? Courage - because he would have to act more boldly than any other IBM chairman since Tom Watson�s (Jr.) S/360 project (in the early 1960s). Humility - because Gerstner would have to give up the empire-building, and concentrate on creating wealth for the shareholders, including himself, of course. Does Gerstner Have What It Takes? Does Gerstner have the courage and the humility to do it? Evidently he did not. Which is why eight years later, Sam Palmisano is having to clean up the leftovers of the Gerstner administration. 2003 IBM: "IBM vs. HP: Spinning Global Server Market Shares" (Nov 2003); "Finally Heard, Part II," (Nov 2003), �Small Is Now Big at Big Blue� (Oct 16), �On the Nose But No Cigar� (July 16), �A Paler Shade of Blue� (June 2), �Save, Spend and Split� (May 8), �Shrunk by the Marketplace� (Apr 17), �Turnaround Continues...� (Apr 15), "Finally Heard!" (Jan 29), �Start of a Real Turnaround?� (Jan 17). 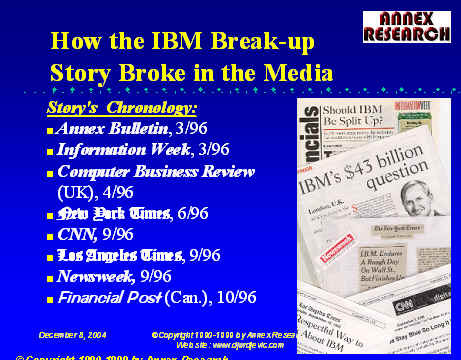 2002 IBM: �Gerstner: The Untold Story� (Dec 27), "Gerstner Spills the Beans" (Dec 13), "On a Wing and a Prayer" (Oct 21), "IBM-PwC Tie the Knot" (Oct 2), Big Blue Salami (June 19), "Looming IBM Layoffs" (May 14), "IBM 5-Yr Forecast: From Here to Eternity?" (Apr 2002), �Tough Times, Soft Deals,� (Apr 25, 2002), �Gerstner�s Legacy: Good Manager, Poor Entrepreneur� (Jan 2002), IBM Pension Plan Vapors: Where Did $17 Billion Go? (Mar 2002), "Sir Lou OutLayed Lay!" (Apr 1, 2002).